The Bible points to God’s new world, where heaven and earth are fully integrated at last, and whose central feature is the personal, loving and healing presence of Jesus himself, the living embodiment of the one true God as well as the prototype of full, liberated humanity. When we talk about Jesus’ “coming”, the reality to which we point is his personal presence within God’s new creation. You can read the whole, eloquently written enchilada here. Don’t fear the apocalypse. Revel in the promise of the Second Coming. What follows was adapted from the provocative article in which Wright gets it right, as usual. Jesus’ resurrection was the prototype, the beginning and the model for the new world that is yet to be. His coming out of the tomb into a new life was the personal, close-up equivalent of the Israelites emerging from their slavery in Egypt. The hope is that God will eventually do for the whole creation what he did for Jesus; God is at work in the present, by the Spirit of Jesus, to prepare the world for that great remaking, that great unveiling (that great apocalypse, in fact) of the future plan. But that future, when it arrives, will not mean the abandonment of the present world, but rather its fulfillment. The whole creation, says Paul, will be liberated from its present enslavement to the forces of decay and death. You don’t liberate something by destroying it. All the beauty, all the goodness, all the pulsating life of the present creation, is to be enhanced, lifted to a new level, in the world that is to be. 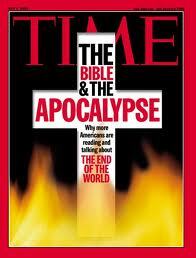 There is no room here for the dualism that goes with so much apocalypticism. Rather there is a strong incentive to work, in the present, to anticipate the new world in every possible way. Those who are grasped by the vision of God’s new world unveiled in Jesus’ resurrection are already sharing in that newness, and are called to produce, in the present time, more and more signposts to point to this eventual and glorious future. The central feature of the hope held out in the Bible is of course the personal presence of Jesus himself. Many Christians, not least those who tend towards apocalypticism, have reduced this feature of the hope to the belief that one day Jesus will appear, flying downwards from the sky, perhaps riding on a cloud. This event, the “second coming”, is in fact the event for which many of the groups who see great significance in the year 2000 are getting ready, not least those going off to Jerusalem to witness it. However, most of the biblical passages that are quoted in support of the idea of Jesus returning by flying downwards on a cloud are best seen as classic examples of apocalyptic language, rich biblical metaphor. They are not to be taken with wooden literalness. And the one occasion when Paul uses the language of descent and ascent (1 Thessalonians 4.16) is almost certainly to be taken in the same way, as a vivid metaphorical description of the wider reality he describes at more length in Romans and 1 Corinthians. Does this mean abandoning belief in the “second coming”? It means taking seriously the whole biblical picture, instead of highlighting, and misinterpreting, one part of it. The problem has been, in the last two centuries in particular, that certain texts have been read from within the worldview of dualistic apocalypticism, and have thus produced a less than fully biblical picture, with Jesus flying around like a spaceman and the physical world being destroyed. And if we really suppose – as, alas, many seem to – that this will be the meaning of the Millennium, we will miss the point entirely. Rather, the Bible points to God’s new world, where heaven and earth are fully integrated at last, and whose central feature is the personal, loving and healing presence of Jesus himself, the living embodiment of the one true God as well as the prototype of full, liberated humanity. 24. Don’t fear the Second Coming. It’s going to be the best day you ever had.